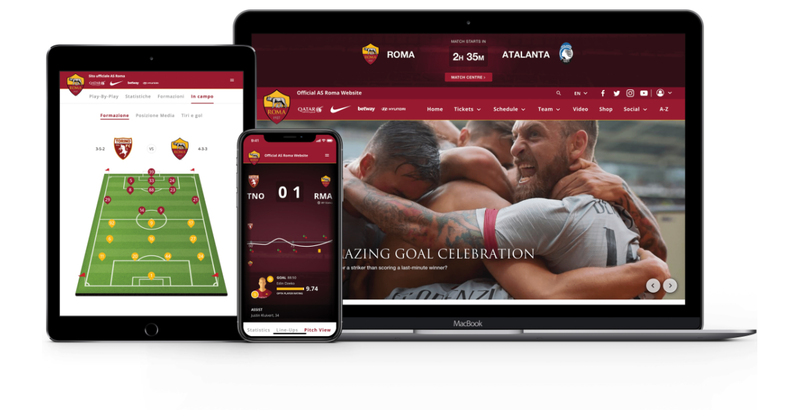 NEW YORK & ROME–(BUSINESS WIRE)–Italian Serie A giant AS Roma has unveiled the relaunch of their flagship website today, in conjunction with their first home match of the season tonight against Atalanta BC. Roma are coming off an exciting season, including an appearance in the Champions League semi-finals, and with a recent deal announcing ESPN will broadcast Serie A matches for the next three years in the United States and Juventus’ signing of Ronaldo, global excitement around the league hasn’t been this high since the 1990s. To relaunch the new site, AS Roma turned to long-time partner OMNIGON, specialists in the thinking, design, development and delivery of experiences that engage global audiences. Working together since 2015, AS Roma and OMNIGON have launched a handful of other digital initiatives including their flagship website launch in 2015 (where, in a first for a professional sports team, Roma used Reddit, the social network news site and independent fan forums, to directly involve supporters in the development of the club’s new, official website), mobile and tablet apps, and a website dedicated to Stadio della Roma, the club’s future home. In 2017, asroma.com was named ‘Best in Class’ at the Interactive Media Awards, the highest possible honour in the Sports category, after judges awarded the website 492 points out of a possible 500. Corebine, developed by the product team at OMNIGON, was built as an audience engagement platform focused on empowering brand and content owners through an innovative set of publishing and sponsor activation tools. Corebine combines the power of OMNIGON's award-winning User Experience (UX) team, expertise in standardizing deployments, robust sports knowledge and fully baked fan engagement product suite to create the optimal digital experience for any rights holder or property. Other properties launched via Corebine include website and mobile experiences for the International Champions Cup, flagship website for CONCACAF and several of its subsequent tournaments, Legends corporate website in addition to several property-specific ones, Champions Hockey League, Westminster Kennel Club with a handful of others currently in development. Founded in 1927, the legendary AS Roma plays in the world-renowned Italian Serie A football league. The Rome based professional team – which is competing in the 2018-19 UEFA Champions League – has won three Serie A titles, nine Coppa Italia title and two Supercoppa Italiana titles. AS Roma’s youth academy regularly produce more Serie A players than any other in Italy. Under the ownership of president and owner Jim Pallotta, Roma is making great strides on and off the pitch, with approval granted to build a new 52,500-seat stadium and surrounding entertainment development – Stadio della Roma. OMNIGON, an Infront Sports & Media Company, is a team of digital strategists, artists and technologists working exclusively in the areas of consumer loyalty, audience growth and digital content delivery. Since its founding in 2008, OMNIGON has established itself as a market leader, focused on helping clients achieve returns on the strategic, creative and technical investments they've made. OMNIGON, headquartered in New York and with teams in Los Angeles, London, Toronto, Kiev and St. Petersburg, works with celebrated, global brands including AS Roma, PGA TOUR, NASCAR, CONCACAF, the United States Golf Association (USGA), International Champions Cup, StubHub, Under Armour, Legends, FOX Sports, the German Football Association (DFB) and countless others.